Coway is the manufacturer of Airmega air purifiers. Established in 1989, Woongjin-Coway is a major industrial conglomerate based in South Korea that makes a range of air purifiers from entry level to state-of-the-art units. In the home country, where air filtration and water filtration has higher market penetration than in the continental United States, Coway air purifiers hold a remarkable 40% market share. 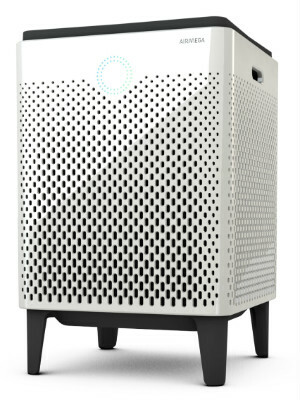 Coway’s brand air purifiers have met some resistance in the congested US market. Coway brought purifiers to America under other-brand marketing deals (RabbitAirs / Idylis), starting around 2007. They are currently headquartered in South Korea along with USA headquarters stationed in Los Angeles. Airmega prospective purchasers should read the general highlights, which are not duplicated for each model. Those who already have their minds made up, scroll on down and find the uniqueness between Airmega 400S, 400, 300S or 300. The Max 2 activated carbon filter claims to remove 99% food smells, harmful gases, VOCs, (volatile organic compounds: paints, cleaning products, refrigerants, etc.) cigarette / pipe smoke and pet odor. Airmega air purifiers also flaunte a Green True HEPA filter, capturing 99.97% of particles, 0.3 micron size that pass through the filter. The Green True HEPA filter removes, impossible to detect, fine dust particles, pollution, pollen, troublesome airborne allergens and fungi. Airmega’s Max 2 activated carbon with Green True HEPA filter sounds really impressive, but True HEPA is merely a marketing term. All high-quality HEPA filters perform the same as standard HEPAs; the major difference being the price point. Now, True Green HEPA filter means its environmental friendly, made out of HEPA, a tight weave of fiber, containing nothing harmful to the environment. Each of the Max 2 filters holds a minimal amount of carbon, less than a pound (0.75). This measurement of carbon is nowhere near enough to handle chemicals and odors over a long period of time. A pound of carbon can be satisfactory for normal settings. However, heavy odor or smoked settings can soak a pound of carbon rather quickly. Compare that to the Austin Air Healthmate HM-400 HEPA air purifier packing 15 pounds of activated carbon. When looking for the Max 2 filters via Amazon, it states the Green True HEPA filter is infused with natural ingredients (gingko + Japanese sumac). The Coway Customer Service rep confirms this is no longer accurate and these items have been removed from the Max 2 filters. There are some past reviews vocalizing frustrations with the ingredients included in green HEPA filter, with people reporting allergy type symptoms from it. The Max 2 change button indicator shows the HEPA filter lifetime at five levels (100%, 80%, 60%, 40% and 20%). Measuring lifespan based on time the unit has been running, and the speed it’s running at, not solely the passage of time. 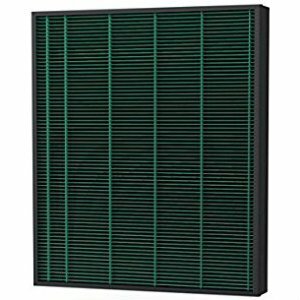 The pre-filter and activated carbon with Green True HEPA filter set is slated for a twelve-month replacement cost in the proximity of $129. By way of micro mesh, the two pre-filters apprehend larger particles floating through the air: pet hair, fur, dust collectors, dirt and other fragments. To extend life cycle, the Airmega pre-filters should be vacuumed and washed, as the need arises. The Airmega air purifiers, 400S and 300S, have Wi Fi capability (optimized for iOS and Android devices). By downloading the Airmega mobile app (via Apple App or Google Play Store), you can take charge of your air quality from almost any location, as long as you have cell phone strength. Real-time air quality monitoring is offered in three distinct modes – Auto, ECO and Sleep. In Smart Auto Mode, the air purifier faithfully alters the air speed according to the current air quality of the room. Set on ECO Mode, the condition of the air is consistently monitored. In Smart Sleep Mode, the built-in sensor, detects when it becomes dark, and, by its own nature, adjusts the fan speed to run quieter, thereby reducing power. If the indoor air meets a “good” benchmark (for more than ten minutes), the fan shuts down to conserve energy. If the air purifier detects air pollution, the fan will automatically restart to boost up the purification process. You can use more than one Smart phone to link into your Airmega 400s or Airmega 300S -- just download the app on each instrument, and sign in using the same passwords. The Airmega draws air in from the sides and exhausts through the top, allowing the unit to sit fairly close to objects and walls. The pollution sensor (wiping of the lens and dust inlet/outlet with a dry cotton swab) needs to be cleaned every two months for maximum effectiveness. Armed with pollution monitoring capabilities, the air quality indicator constantly senses the air pollution level around the unit. With in-home particle counter tests conducted for my own benefit, it became quite apparent that quiet, low speed operation, rarely acquires or maintains truly clean air. All four units share a noise level of 22-52 dB, depending on fan speed. One customer review claimed the device does turn on and off automatically. However, when switching into Smart Mode, it plays a melody which is *not* great when placed in a bedroom and the chime can wake you up. This chime is not able to be disabled, nor the volume adjusted. Airmega 400S, 400, 300S and the 300 have no ionizers or UV lamps and do not produce ozone. The display light on the front of the AirMega is too bright; great for daylight hours; but not so hunky dory otherwise. This is not an uncommon complaint, coming in from high end premium air purifiers to the least expensive. There are various “bandaid” solutions to the unwarranted night time dilemma. My favorite and one that’s worked wonders, is a little “duct tape” goes a long way. No duct tape, try draping a dark colored hand towel over the top at night. Airmega does not carry the EPA ENERGY STAR seal. No need to be alarmed, not all manufacturers put much weight in the ENERGY STAR movement. Energy usage on high speed is 66 Watts, and Dust CADR score is 340, the ratio is 5.1 D/W. Energy Star ratings start at 2.0 Dust CADR/Watt. Stingy enough on electricity, all Airmega air purifiers meet the EPA ENERGY STAR rating. Most air purifier users over-install their units, believing this is cost effective. Set in too large an area, most air cleaners fail to lower toxic levels sufficiently, then complaints abound that the air purifier hasn’t done its job. Always put the air purifier in spaces smaller than recommended. That equates to buying an air purifier with CADR, equal to or higher than, room size in square feet. The manufacturer’s suggested room size for the Airmega 400S is 1,560 sq. ft. In an area of 500 to 700 square feet, you need 700 CADR. Airmega CADR specs do not come anywhere close to a 1,560 sq. ft. size room. It’s hard to differentiate between the four models in writing, but clear as a bell, side by side. The major selling point, the “S” series, the Airmega 400S and the Airmega 300S, are Wi Fi capable, the Airmega 400 and Airmega 300 are not. The size of the Airmega 400S & Airmega 400 (H x W x D 22.8 x 14.8 x 14.8) is about 20% larger than the Airmega 300S & Airmega 300 (H x W x D 21.2 x 13.6 x 13.6. Airmega 400S & 400 weighs in at 24.7 pounds and the Airmega 300S & 300 air purifiers tip the scale at 21.2 pounds. Built-in carry handles makes for ease of movement. However, coming in close to 25 pounds for the Airmega 400S and 400, a few wheels (for the less able-bodied) would greatly improve one’s ability to transport. Amazon renders a respectable 4.6 out of 5 stars for the Airmega 400S and 300S, and a less-than-flattering 3.9 for the Airmega 400 and 300. All four units have identical washable air purifier pre-filters and Max 2 filter set (activated carbon and Green True HEPA), same real time monitoring and air purifier fan speeds. Airmega comes with a five-year limited warranty. Coway warrants that the motor and electronic parts be free from manufacturing defects (from date of original investment). Air purifier buyers should understand that many hurdles stand in the way of a claim, i.e. serial number or date of purchase is difficult to decipher or claim not timely made, proof of purchase from authorized dealer, etc. Airmega customer service can be reached at 800-285-0982. No reports on being on hold, for long periods of time and the reps are quite helpful. For those with a hefty budget looking for a well-designed air purifier, with all the bells and whistles, who are into smart-home mania, and want the latest gadget to control your home from anywhere, any time, this could be the air purifier you’re looking for. Airmega Air Purifiers at Amazon.com. Airmega (1-Year) Max 2 Replacement Filter at Amazon.com.